To record the complete Bruckner symphonies is a major undertaking, not to be taken lightly by any of those involved: conductor, orchestra, recording engineers, record company. Therefore it needs to be said at the outset that Naxos has achieved a veritable triumph, nothing less. The tragedy is that the conductor, Georg Tintner, is no longer alive to witness its full acknowledgement. Tintner (born 1917), like so many musicians, fled his native Austria before the Nazi threat and made a worthwhile but largely unnoticed career in Australasia, Canada and, occasionally, Europe. These recordings , dating from 1995-98, brought him a recognition that was long overdue. For Tintner's love and understanding of Bruckner are beyond question. Tempi, phrasing and architecture always feel right, and the structural control of each of the symphonies is never less than assured. The rarities among Tintner's recordings include the Symphony no. 00 (1863), sometimes known as the 'Study Symphony', a 'student' work composed before Bruckner found his unique voice and style. This hardly sounds like the genuine article but it receives a fiery and committed performance, well worth hearing. It is coupled with the 'Volksfest' finale of the Symphony no. 4, pre-dating the 'final' version which is generally heard, and which Tintner has recorded in its 'proper' context. (There is, however, an edition from 1888 which is little known.) Having this additional item makes for fascinating comparisons for anyone collecting the complete set. The Symphony no. 0, another piece published only after the composer's death, is coupled with the Eighth (see below). While the Irish orchestra cannot match the richness of tone of their Scottish (and other, yet more celebrated) counterparts, this remains a hugely enjoyable recording. It is surely a tribute to Tintner's skill in preparing the performance, since this orchestra can hardly have played the music many times, if at all, before 1996 when the recording was made. 'Die Nullte', as it is known, is altogether more characteristic than the 'Study Symphony', and as such is fully deserving of a place in the Bruckner canon; it is by no means a mere curiosity. The magnificent sweep of the opening phase is proof enough of that. The release of the Symphony no. 1 followed the remainder of Tintner's series, and in common with those of the other earlier pieces, it is a particularly successful performance. The recording is pleasing too, the Scottish orchestra captured with warm and full tone in the pleasing acoustic context of Henry Wood Hall in Glasgow. Tempi are relatively broad, but there is no sluggishness; rather the music develops naturally, allowing the strength of Bruckner's invention to take centre stage. The advantage of the Linz version (and this is the only recording to feature the completely unrevised score) over the Vienna revision made some 25 years later lies in the music's simpler, less burdened textures. These are wholly in keeping with the nature of the material. In 1876 Bruckner made a further revision of the slow movement of the 1873 score of the Third Symphony, involving a somewhat faster tempo marking, a more subtly scored opening phase, and more complex textures at the final climax. For devotees of the composer, this represents a new opportunity to gain further insights into a great but texturally problemmatic work. For the more general listener the interest is less profound, simply as an unusual 'filler' supporting the main agenda of this CD. The performance of Symphony No. 2 is among the best ever recorded, and again the score is itself of interest, only the second time the original 1872 version has been issued; the other is conducted by Kurt Eichhorn on Camerata). Known as the 'Pausen' symphony on the grounds that the development of the material requires the effective use of pauses between potent phrases, the music is lovingly shaped by Tintner, with exactly the right tempi and balances to make the most of the special expressive effects Bruckner had in mind. The Symphony no. 3 also features the Scottish orchestra to compelling effect. This is the original 1873 version, not the later, shortened scores of 1877 and 1889. This version has been recorded only twice before, conducted by Eliahu Inbal and Roger Norrington, but in vision and commitment Tintner outshines them both, adopting broad tempi to magnificent effect. Such doubts as may have persisted as the result of more famous conductors (B"hm, Haitink, etc.) preferring the later editions are simply swept away. The music can satisfy in these revisions, certainly, but this Tintner recording sets a new agenda. The Symphony no. 4, recorded in Glasgow in October 1996, is another success. At nearly 75 minutes the vision is broad once again, but it is also absolutely right. Although other recordings (Gnther Wand on RCA, for instance) generate greater intensity and richness of tone, there is no reason to hesitate at the attractive Naxos price. And in any case, Tintner brings his own insights to this wonderful score. If the cycle contains a disappointment, for me it is the Fifth Symphony, again played by the Scottish orchestra. Here the tempi are relatively quick, and the reading seems lightweight. A curious description of a Bruckner symphony, perhaps, but compared with, for example, Karajan on DG, Tintner seems to be adopting an approach which deliberately avoids the monumental aspect of the work, which surely lies at its heart. Comparisons are fascinating, certainly, but on this occasion the weight and pace of the performance are surprisingly light and flowing, and the music lacks the cosmic power it has generated elsewhere. A comparison of timings in the slow movement, a true Adagio, makes the point as clearly as words alone can convey: whereas Tintner takes 16 minutes, Karajan takes a full five minutes longer. And the music is the better for it. Having said that, the playing of the Scottish orchestra is highly satisfactory, and the recording more than adequate. Ultimately the judgement has to be that any great symphony is greater than any single performance of it, and different interpretations are therefore a cause for rejoicing. There is room for both approaches, but also there is no question which I prefer and which I would merely describe as 'interesting'. The Sixth Symphony has had a mixed success on disc, but the position is more favourable now than it has ever been. Curiously Karajan's recording was one of his least successful of Bruckner or anything else, come to that. Now Tintner offers a splendidly judged account, with rhythmically vital outer movements and a beautifully judged Adagio, one of Bruckner's greatest slow movements. His account takes a worthy place alongside those of Klemperer (EMI) and Wand (RCA). Also Stanislav Skrowaczewski and the Saarbrcken Radio Symphony Orchestra on Arte Nova are magnificent in this work, aided by a recording - and possibly playing too - which is rather more full-bodied than Naxos provides for Tintner. The differences are marginal, however, and although the New Zealand Orchestra hardly rates among the world's great Bruckner ensembles, their performance is sensitive, disciplined and idiomatic, in keeping with Tintner's interpretation. 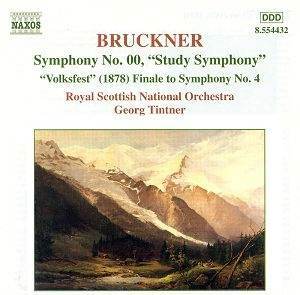 The Seventh Symphony contains one of the most straightforward authenticity issues in Bruckner. Should there or should there not be a cymbal clash at the climax of the slow moment? Opinions vary, the evidence is far from clearcut, and the music is strong enough to triumphantly accommodate either approach. Tintner leaves it out, opting instead for full sonority, a decision which the orchestra and the Naxos engineers justify to the full. The pacing and phrasing of the whole performance is quite splendid, and even among the other fine performances this rates as extra special. The way that the beautifully lyrical opening phase of the symphony is phrased and balanced confirms that a master is at work. Even those who own alternative excellent performances - and this symphony is well served on disc - should add Tintner to their collections. As far as the vexed question of editions is concerned, it is a cause of some regret that Tintner only recorded the first (1887), rather than the revised (1890), version of the Eighth Symphony. It is far too easy a generalisation to suggest that Bruckner's first thoughts were always best, and in this, surely his greatest symphony, it is the revised version which is generally played and which is certainly superior. Surely Tintner would have gone on to record it had fate decreed him the chance to do so. As it stands the Eighth that is available here is best judged as an interesting performance of an interesting piece, beautifully played by the Scottish National Orchestra and given a rare opportunity to be widely heard. But if you want only one performance of the symphony in your collection, you will have to look elsewhere: to Giulini (DG), Karajan (DG) or Wand (RCA), for example. As for the unfinished Ninth Symphony, in this monumental work Tintner and the Scottish National Orchestra are a match for any rival version. With its full toned sound, beautifully judged control of pacing and dynamics, this performance is so compelling that it is veritably the jewel in the crown of the entire Naxos series. And these discs surely rank among the most significant contributions to the catalogue of recorded music of recent years.